Until the dwarf planet category was created in 2006, Pluto was the 9th planet in our solar system, and furthest from the Sun. As many more of these Pluto-like worlds were discovered, Scientists decided to create this new category for two reasons. First off, these planets are very small. Each of the ones discovered so far are smaller than the Earth's moon. Secondly, the small planets have not yet "cleared their path" of orbit. This means that the route they take crosses over another object also orbiting the Sun. 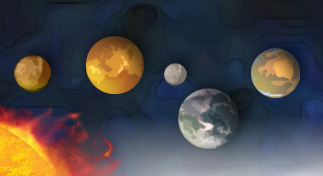 So far there are already five worlds in the new category. 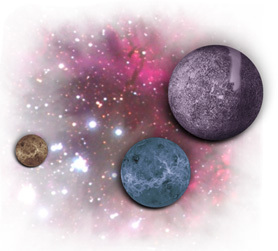 These include Pluto, Ceres, Haumea, Makemake, and Eris. The largest of the five is Eris, which is about 120 kilometers larger than Pluto. The most interesting of these worlds may be the planet Ceres, which is located in the asteroid belt between Mars and Jupiter. Scientists believe the planet may have an ocean of water, which could contain life, or evidence of past life! In 2007, NASA launched its Dawn mission. A space probe is due to arrive at Ceres in 2015. Once the probe arrives it will begin taking pictures of the small world. A closer view could indicate whether or not Ceres has the potential for life; how exciting! *Pluto the dog (from Mickey Mouse) was named after the planet, recently after it was discovered. *Although small, Ceres can be seen with a good telescope! *NASA launched the New Horizons probe in 2006, which will uncover more information about Pluto, its moons, and the neighboring planets by 2015. *If Mercury had no "cleared path" of orbit, it would also be considered a dwarf planet. It too contains no substantial atmosphere and is very small in comparison to the larger planets.